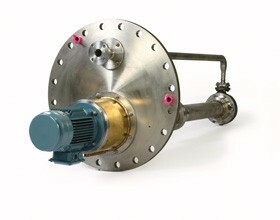 V Series pumps are designed to API610 10th edition specifications for the Petrochemical, Chemical and Oil & Gas markets. All API materials are available as standard to match your application, plus bespoke options including NACE compliant materials. Standard Documentation, Testing and NDT packs are offered. Alternatively bespoke packages can be tailored to fit your exact requirements. A range of vertical long shaft single stage centrifugal end suction sump pumps manufactured in a variety of alloys. VS4 API and industrial versions available. Designed to suit customer requirements with lengths available up to 6m sump depth. Heavy duty modular design maximising flexibility to suit customer's application.